To boil water and milk in different saucepans. In boiling water to thrash tea and at once to infuse into boiling milk. To cook tea on a middle fire, stir up slowly, 5-6 minutes. 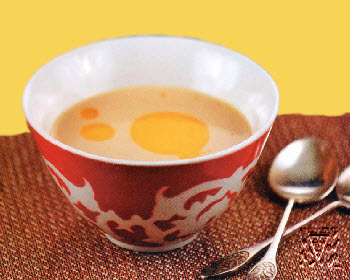 To salt tea to liking, to pour out on drinking bowls, put in each the piece of butter and to serve up. On a 1 glass: a 5-6 g of tea, 100 g of water, 100 g of milk, 15-20 g of butter, salt and pepper to liking.